Actor and comedian Will Ferrell, who plays TV anchorman Ron Burgundy, stays in character and speaks during a news conference at Emerson College in Boston, Wednesday, Dec. 4, 2013. Ron Burgundy called his play-by-play debut among the top 1,000 things he's ever done. Legendary TV anchorman Ron Burgundy gave hockey fans quite a treat Thursday when he joined the broadcast booth as the Los Angeles Kings took on the San Jose Sharks. It was a night filled with emotions, milk and a burrito. Burgundy, who also happens to be Will Ferell's "Anchorman" alter ego, spent the second period of the LA Kings game on the Fox Sports broadcast handling play-by-play duties and dishing up all sorts of hockey knowledge. "Martin Jones, former Kings player...you know what he does in the off-season? He works with puppets," he explained. "For those of you at home, we've had to stop action on the ice several times. Feral cats have run onto the ice," Burgundy announced at one point. The night wouldn't be complete without a visit from the Kings' mascot, who brought a burrito and milk. 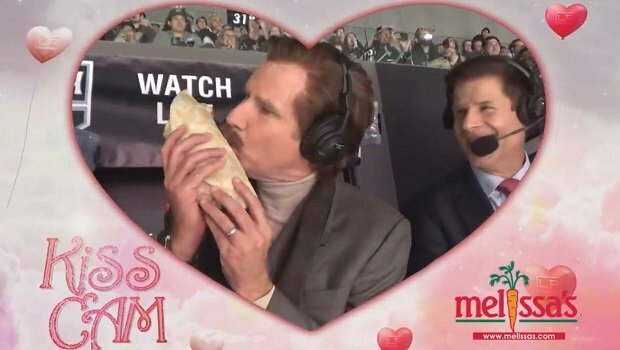 And of course, there was even an appearance on the kiss cam, where Burgundy smooched his burrito. The Los Angeles Kings had broadcast legend Ron Burgundy in the booth on Thursday night during their game against the San Jose Sharks. Before wrapping up his play-by-play duties, Burgundy proclaimed it one of the best nights of his life...sorta. "I've done a lot of things in my life, a lot of things in the career, and this is truly in the top, I think 1,000 things I've ever done in my life." Thankfully the NHL has preserved the visit for all to enjoy in a 32-minute video.